The Samsung Medison Accuvix A30 ultrasound is a mid-high range system designed for imaging performance and operational convenience. 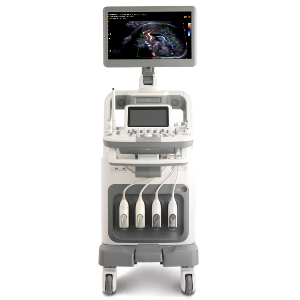 Offering performance-enhancing features such as EZ Exam and ElastoScan, among others, this portable ultrasound facilitates greater speed and accuracy for critical clinical decisions in various settings, including OB/GYN, vascular, small parts, superficial, abdominal, and other general imaging studies. In terms of imaging, the Medison Accuvix A30 includes a large, 21.5-inch LED monitor complete with enriched 3D performance features and uncompromising image quality. Furthermore, by adopting the advantages of Cathode Ray Tube (CRT) and LCD technology, this ultrasound offers high-contrast and superior resolution. Underneath the hood, operators will be able to take advantage of this ultrasound’s Hybrid Beamforming Engine, which enables more in-depth and detailed scanning. Combined with enhanced DPDI, Dynamic MR Plus, EZ Exam, and more, you can expect optimal efficiency and imaging quality, including 4D OB/GYN capabilities. The price of the Samsung Medison products make them very attractive for offices, small hospitals, and other departments looking for an advanced ultrasound at a reasonable price. These are typically found at lower prices than most other manufacturers, and the Accuvix A30 creates a competitor to many high-end ultrasound machines with advanced imaging features as well as outstanding 4D images.